Pop another slice in the toaster! If you can conceive it and the willingness to try and make it a reality, sometimes some truly incredible things can be created and other times, you can just make something that is utterly bonkers and Toast Time: Smash Up is certainly a mix of the two! 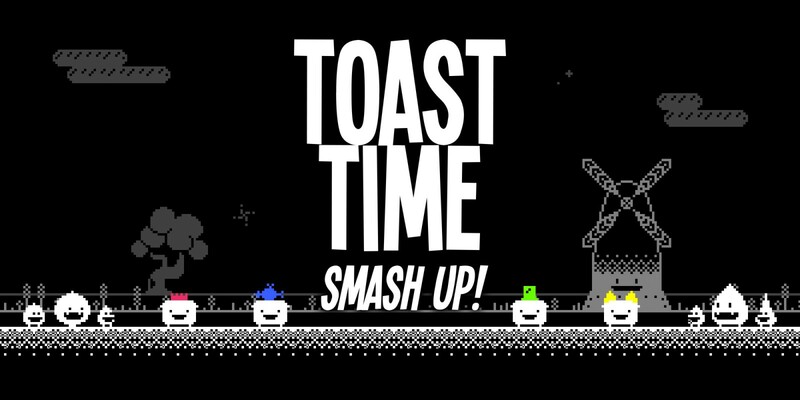 Baked by Force of Habit, Toast Time: Smash Up is a self-described multiplayer brawler that features “unique toast-based recoil/reload action” that players first caught a glimpse of, back in 2014 when Toast Time, released on Steam. Despite featuring the pixelated appearance most indie games go for, which some may deem being too simple or even bland, the colour contrasts and backgrounds are actually one of the features that first saw the game receive so much praise the first time around. Its soundtrack isn’t too shabby either as it is rather endearing, but it is the premise, humour and gameplay that make Toast Time the enjoyable time waster it is, so let’s talk about those, shall we? The spare time in which they seek is a clock that players need to stop them from reaching at any cost, since as long as one of them reaches it, you will fail the level. So, to stop them from reaching it, players must unleash their sliced bread and shoot them by aiming with the left analog stick pressing the A button to fire. You will need to be careful however, since firing will cause TERRY to bounce around. TERRY’s ricochet reaction isn’t the worst thing in the world however, since it does allow him to reach new platforms and areas where the likes of crates can be lurking. Not only can collecting these crates grant him a power-up in the form of one of the game’s 16 bread-based weapons but when you collect enough of them, they will allow you to unlock things as well. More on that later though. To beat the missions, for the most part, you just have to survive for a set period of time (40 seconds for example,) but some levels will limit you on how many shots you can take and attempting to fully complete a level (getting all 3 stars on it,) will require you to collect a certain amount of crates and reach/surpass the target score. (Just beating the level awards 1 star.) One way to rack up the points however, is to get a combo of 20 and activate Coffee Time. Failure to maintain a combo will cause you to lose it, thus reducing the amount of points you’ll get per kill. A high score isn’t everything though since your focus would be better off on collecting the crates, because not only are there 16 weapons that can be unlocked (300 crates are required to unlock them all,) but should you collect 2000 of them, you will be able to unlock the game’s 55 different customisations. Granted these customisations only consist of the hats that TERRY loves, different facial expressions and eyewear (such as a monocle,) but these coupled with miscellaneous items like a Magician’s Wand, all help to make TERRY become the adorable toaster you wish him to be. But if you don’t want to customise him personally, you can always hit randomise when in the game’s Tailor menu. As for three other things you can do with the single player campaign, the first is do your best to achieve the game’s 8 trophies. The second thing is to consult your stats and see how you’ve done. The third thing however is more wholesome as content packed as it’s a Survival mode for players to endure. Not only is the mode great for snagging more crates, but you get to act and shoot on the fly, perfecting your skills in a bid to survive for as long as you can before returning to the main campaign. If the single life is not for you however, as long as you have a friend to play with, you can always opt to engage in multiplayer and check out just what exactly it is this game has, which allows it to be defined as a brawler. Admittedly, there isn’t an awful lot to the mode, but with up to four players supported, customisable appearances and a number of weapon classes and rules to utilise, there is enough substance and range there so that players can sink a couple of hours into it and have an egg-cracking good time. If you looked in a dictionary for the definition for “recipe for disaster,” there will not be any mention of Toast Time: Smash Up! whatsoever. It may look a tad too basic for some and have a bread focus that is asinine in nature, but it is a crusty little title that is a lot more fun than it looks. Sure, the replay value may get a little stale over time, but it is certainly not a mouldy loaf! Tags: eShop, Force of Habit, Nintendo Switch, review, Toast Time: Smash Up!